The US Department of the Interior recently released a list of 35 “Critical Minerals” including tellurium. With China producing over two thirds of the world’s consumption of the metal today certainly the mineral would be in serious shortage should the current trade war between the US and China get even more stupid. 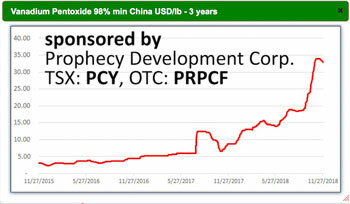 I’m not sure exactly what putting a mineral on the critical shortage list actually means for mining companies interested in the production of tellurium but it raises an interesting issue of what might happen to price and how it would affect a junior exploration company. Wouldn’t it be nice if tellurium became the flavor of the day in the same way vanadium did? 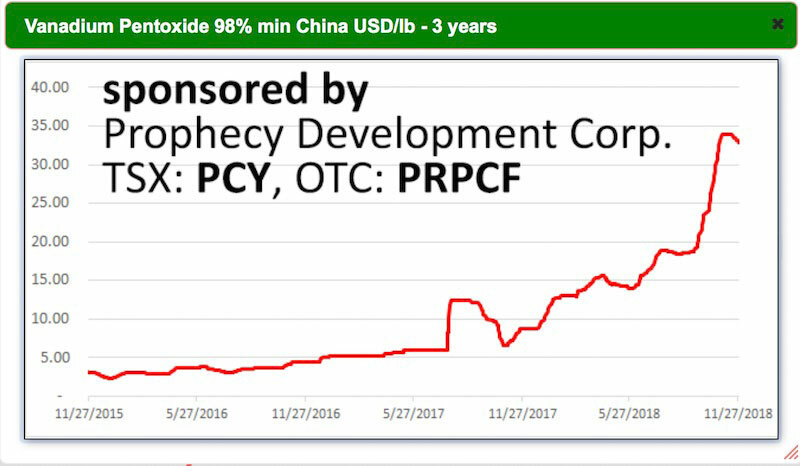 The price of vanadium rocketed higher from just over $5 a pound to almost $35 a pound in under eighteen months. Tellurium certainly could do an instant repeat. I know of only one company dedicated to the exploration and development of a tellurium project and that would be Deer Horn Capital (DHC-C) with two major projects; one in Canada and one in Colorado. The primary project is the Deer Horn Mine located in central BC with North America’s only silver, gold, tellurium project with a 43-101 resource and a PEA. The PEA numbers show a modest 100,000-ounce gold resource with 3 million ounces of silver and 93,000 kg of tellurium. The PEA used numbers of $1300 for gold, $17 for silver and $100 a kilo for Te. Obviously the prices for gold and silver are higher than current prices but the after tax IRR was a healthy 42% with a NPV of $36.5 million. Given that at today’s stock price, down 65% in six months, of about $.20 a share, the company has a seemingly absurd market cap of under $2 million. Deer Horn owns 50% of the Deer Horn mine and has an option on an additional 25%. Tellurium is an interesting metal used primarily in the production of solar panels and steel. In general the metal is produced as a by-product of high grade copper refining. As the grade of copper has decreased over the past twenty years, the production of tellurium has been restricted. There are few primary producers of tellurium. Deer Horn has been recognized by First Solar as one of the world’s top four primary tellurium mines. First Solar actually wanted to control their own requirements for tellurium and owned several potential projects, one being the Colorado Klondike tellurium property in south central Colorado. On October 10th of this year Deer Horn announced the signing of a binding Letter of Intent (LOI) on the project. While owned by First Solar a preliminary ground survey found grab samples of up to 3.3% tellurium. At today’s price for Te, that would be $3300 a ton rock. Obviously a lot more work has to be done by Deer Horn to advance the project. During the best of times, shares in junior resource companies are at least cheap lottery tickets. That’s also true during the worst of times and that’s where we seem to be today. But Deer Horn is worth something and could have a substantial advance based on positive results. It’s a lottery ticket on a critical and rare metal controlled by a company with one of the very few mines capable of production. Deer Horn is an advertiser. I have participated in the private placement and naturally I’d like to see them succeed. Please do your own due diligence. Their fact sheet is located here. Read it.